Package includes the books “How To Be Successful at Sponsorship Sales” and the DVD version of the 12 Steps To Sponsorship Success program. Empower your organization with these acclaimed resources! 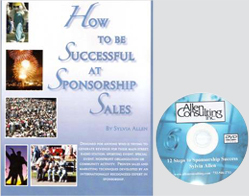 In the DVD version of the 12 Steps To Sponsorship Success program, Sylvia Allen (“The Queen Mother of Sponsorship”) brings to viewers her highly successful techniques. Allen provides everyone from novices to seasoned sales professionals with the tools necessary to mount a successful and profitable sponsorship sales campaign.